“Specification” means any specification for the Goods and/or the Services, including any relevant plans and drawings, that is agreed in writing by the Customer and Glass & Stainless. 1.2 A reference to a statute or statutory provision is a reference to such statute or provision as amended or re-enacted. A reference to a statute or statutory provision includes any subordinate legislation made under that statute or statutory provision, as amended or re-enacted. 1.3 Any phrase introduced by the terms “including”, “include”, “in particular” or any similar expression shall be construed as illustrative and shall not limit the sense of the words preceding those terms. 2.1 The Order constitutes an offer by the Customer to purchase the Goods and the Services (if any) in accordance with these Conditions. 2.2 The Order shall only be deemed to be accepted when Glass & Stainless issues written confirmation of the Order at which point and on which date the Contract shall come into existence (“Commencement Date”). 2.3 The Contract constitutes the entire agreement between the parties. The Customer acknowledges that it has not relied on any statement, promise, representation, assurance or warranty made or given by or on behalf of Glass & Stainless which is not set out in the Contract. 2.4 Any samples, drawings, descriptive matter or advertising issued by Glass & Stainless and any descriptions of the Goods or illustrations or descriptions of the Services contained in Glass & Stainless’ catalogues or brochures are issued or published for the sole purpose of giving an approximate idea of the Services and/or Goods described in them. They shall not form part of the Contract or have any contractual force. 2.6 All of these Conditions shall apply to the supply of both the Goods and the Services (if any) except where application to one or the other is specified. 3.1 Glass & Stainless shall deliver the Goods to the location set out in the Order or such other location as the parties may agree (“Delivery Location”) at any time after Glass & Stainless notifies the Customer that the Goods are ready. 3.2 Delivery is completed on the completion of unloading of the Goods at the Delivery Location by a member of Glass & Stainless team or a courier appointed by Glass & Stainless. Glass & Stainless shall not be responsible for any loss or damage to the Goods caused by the Customer’s negligence upon taking receipt of delivery of the Goods. 3.3 The Customer shall ensure that a representative of the Customer is available to assist with the unloading of the Goods at the Delivery Location. If the Customer is unable to provide a representative to assist with the unloading, the Customer shall advise Glass & Stainless at the point of placing the Order so that the Charges can be adjusted accordingly. 3.4.2 the Customer’s failure to provide Glass & Stainless with adequate delivery instructions or any other instructions that are relevant to the supply of the Goods. 3.5.2 Glass & Stainless shall store the Goods until delivery takes place, and charge the Customer for all related costs and expenses (including insurance) and any failed delivery fees charged to Glass & Stainless by its courier. 4.1.4 meet the applicable British Safety Standards. 4.2.2 Glass & Stainless is given a reasonable opportunity of examining such Goods, Glass & Stainless shall, at its option, repair or replace any Goods that are found to be defective, or refund the price of such defective Goods in full. 4.3.6 the Goods differ from their description or the Specification (if any) as a result of changes made to ensure they comply with applicable statutory or regulatory requirements. 4.4 Glass & Stainless’ only liability to the Customer if the Goods fail to comply with the warranties set out in clause 4.1 is as set out in this clause 4. The terms implied by sections 13 to 15 of the Sale of Goods Act 1979 are, to the fullest extent permitted by law, excluded from the Contract. 4.5 The terms of these Conditions shall apply to any repaired or replacement Goods supplied by Glass & Stainless. 5.1 Risk in the Goods shall pass to the Customer on completion of delivery of the Goods or on completion of the installation of the Goods (if such services are being provided by Glass & Stainless under the Contract). 5.2 Title to the Goods shall only pass to the Customer once Glass & Stainless receives payment in full (in cash or cleared funds) for the Goods. 5.3.5 give Glass & Stainless such information relating to the Goods as Glass & Stainless may require form time to time. 5.4 Glass & Stainless may recover Goods in which title has not passed to the Customer. The Customer irrevocably licenses Glass & Stainless, its officers, employees and agents, to enter any premises of the Customer (including with vehicles), in order to satisfy itself that the Customer is complying with the obligations in clause 5.3, and to recover any Goods in which property has not passed to the Customer. 6.1 Where the Customer orders Goods by reference to a template (the “Template”), the Customer shall be responsible for providing Glass & Stainless with the Template. 6.2 Glass & Stainless accepts no liability for the accuracy of the Template and makes no warranties regarding its suitability or fitness for any purpose. 6.3 Glass & Stainless shall not use the Template for any purpose other than the supply of Goods in accordance with the Contract. 6.4 Glass & Stainless reserves the right to retain (or destroy) the Template once the Goods have been supplied in accordance with the Contract. 7.1 Glass & Stainless shall provide the Services (if any) to the Customer in accordance with the Contract and the Specification (if any) in all material respects. 7.2 Glass & Stainless shall use reasonable endeavours to meet any performance dates for the Services specified in any Specification and/or agreed between the parties, but any such dates shall be estimates only. 7.3 Glass & Stainless shall have the right to make any changes to the Services which are necessary to comply with any applicable law or safety requirement, or which do not materially affect the nature or quality of the Services, and Glass & Stainless shall notify the Customer in any such event. 7.4 Glass & Stainless warrants to the Customer that the Services will be provided using reasonable care and skill. 7.5 The conditions implied by sections 3,4 and 5 of the Supply of Goods and Services Act 1982 are, to the fullest extent permitted by law, excluded from the Contract. 8.1.7 keep and maintain all materials, equipment, documents and other property of Glass & Stainless (“Supplier Materials”) at the Customer’s premises in safe custody at its own risk, maintain the Supplier Materials in good condition until returned to Glass & Stainless, and not dispose of or use any Supplier Materials other than in accordance with Glass & Stainless’ written instructions or authorisation. 8.2.3 the Customer shall reimburse Glass & Stainless on written demand for any costs or losses sustained or incurred by Glass & Stainless arising directly or indirectly from the Customer Default. 9.1 In respect of supply of any Goods only, Glass & Stainless shall invoice the Customer for the Charges on or at any time after dispatch of the Goods. 9.2 If the Customer causes a delay to the delivery of the Goods (for example if they advise that the Goods cannot be delivered until a later date than the agreed delivery date) or the Customer makes amendments to their Order after production of the Goods has commenced, Glass & Stainless shall be entitled to invoice the Customer for the Charges once the Goods are ready for dispatch even though the delivery date of the Goods has been delayed. 9.3 If Goods and Services are being supplied to the Customer, Glass & Stainless shall invoice the Customer for the Charges on or at any time after completion of the Services. 9.4 The Customer shall pay each invoice submitted by Glass & Stainless within 30 days after the end of the month in which the invoice is issued (unless otherwise agreed) and in full and in cleared funds to a bank account nominated in writing by Glass & Stainless. Notwithstanding any other provision in these Conditions, if a credit account for the Customer has not been approved or put in place by Glass & Stainless, Glass & Stainless may issue a pro-forma invoice to the Customer and such invoice must be paid by the Customer before the Order can be processed. 9.5 If the Customer fails to pay any sum properly due and payable (other than any sum disputed in good faith) by the due date for payment, Glass & Stainless may exercise its rights under the Late Payment of Commercial Debts (Interest) Act 1998 in respect of such late payment. 9.6 The Customer shall pay all amounts due under the Contract in full without set-off, counterclaim, deduction or withholding (except for any deduction or withholding required by law). Glass & Stainless may at any time, without limiting any of its other rights or remedies, set off any amount owing to it against any amount payable by Glass & Stainless to the Customer. 10.1 Nothing in these Conditions shall limit or exclude Glass & Stainless’ liability for death or personal injury caused by its negligence, or the negligence of its employees, agents or subcontractors (as applicable), for fraud or fraudulent misrepresentation or for any other matter in respect of which it would be unlawful for Glass & Stainless to exclude or restrict liability. 10.2.2 Glass & Stainless’ total liability to the Customer in respect of all other losses arising under or in connection with the Contract, whether in contract, tort (including negligence), breach of statutory duty, or otherwise, shall in no circumstances exceed the sum of the Charges. 10.3 This clause 10 shall survive termination of the Contract. 11.1.4 the other party’s financial position deteriorates to such an extent that in the terminating party’s opinion the other party’s capability to adequately fulfil its obligations under the Contract has been placed in jeopardy. 11.2 Termination of the Contract shall not affect any of the parties’ rights and remedies that have accrued as at termination, including the right to claim damages in respect of any breach of the Contract which existed at or before the date of termination. 11.3 Any provision of the Contract that expressly or by implication is intended to come into or continue in force on or after termination shall remain in full force and effect. 12.1 Force majeure. Neither party shall be in breach of the Contract nor liable for delay in performing, or failure to perform, any of its obligations under the Contract if such delay or failure results from a Force Majeure Event. If the period of delay or non-performance continues for four weeks the party not affected may terminate the Contract by giving 30 days’ written notice to the affected party. 12.2 Assignment and other dealings. The Customer shall not assign, transfer, charge, declare a trust over or deal in any other manner with any or all of its rights or obligations under the Contract without the prior written consent of Glass & Stainless. 12.3 Sub-contracting. 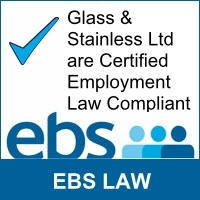 Glass & Stainless may subcontract any of its obligations under the Contract, but, for the avoidance of doubt, no such subcontracting arrangement shall release Glass & Stainless from any of its obligations under the Contract and Glass & Stainless shall remain fully responsible to the Customer for the proper and complete discharge of all such obligations. 12.4 Confidentiality. A party (“Receiving Party”) shall keep in strict confidence all technical or commercial know-how, specifications, inventions, processes or initiatives which are of a confidential nature and have been disclosed to the Receiving Party by the other party (“Disclosing Party”), its employees, agents or subcontractors, and any other confidential information concerning the Disclosing Party’s business, its products and services which the Receiving Party may obtain. The Receiving Party shall only disclose such confidential information to those of its employees, agents and subcontractors who need to know it for the purpose of discharging the Receiving Party’s obligations under the Contract, and shall ensure that such employees, agents and subcontractors comply with the obligations set out in this clause as though they were a party to the Contract. The Receiving Party may also disclose such of the Disclosing Party’s confidential information as is required to be disclosed by law, any governmental or regulatory authority or by a court of competent jurisdiction. This clause 12.4 shall survive termination of the Contract. 12.5 Variation. No variation of the Contract shall be effective unless it is in writing and signed by the parties (or their authorised representatives). 12.6 Waiver. No failure or delay by a party to exercise any right or remedy provided under the Contract or by law shall constitute a waiver of that or any other right or remedy, nor shall it prevent or restrict the further exercise of that or any other right or remedy. No single or partial exercise of such right or remedy shall prevent or restrict the further exercise of that or any other right or remedy. 12.7 Severance. If any provision or part-provision of the Contract is or becomes invalid, illegal or unenforceable, it shall be deemed modified to the minimum extent necessary to make it valid, legal and enforceable. If such modification is not possible, the relevant provision or part-provision shall be deemed deleted. Any modification to or deletion of a provision or part-provision under this clause shall not affect the validity and enforceability of the rest of the Contract. 12.8 Notices. Notice given under the Contract shall be in writing, addressed to the recipient party at its registered office or such other address as that party may have specified to the other party in writing sent to the address and shall be delivered either personally, by courier, or by recorded delivery. A notice is deemed to have been received on signature of a delivery receipt by an individual at the correct address for notices. 12.10 Governing law. The Contract, and any dispute or claim (including non-contractual disputes or claims) arising out of or in connection with it or its subject matter or formation, shall be governed by, and construed in accordance with the law of England and Wales. 12.11 Jurisdiction. Each party irrevocably agrees that the courts of England and Wales shall have exclusive jurisdiction to settle any dispute or claim (including non-contractual disputes or claims) arising out of or in connection with the Contract or its subject matter or formation.